… but were we ever in the first place? Twice in the last week, I’ve received a sorta automatic email from someone I’m pretty sure I don’t know asking me to change their contact information from some old unknown email address to a new one. In each case, there has been a real name associated with the change. But I sure don’t recognize it. I manage a bunch of websites and I write for several publications not to mention the times my address could appear in someone’s address book or contact list because I know someone they know and so we were on the same distribution list one time. So while I certainly appreciate the world keeping me updated with where they are, do I really need to know it? Nope! And really, isn’t one of biggest the reasons to change email addresses is because you were getting too much junk at the old address? I sure AM gonna tell Rolling Stone. I want them to know where I am. We’ve got a life time subscription! And if one day I need to find somebody I once corresponded with over the value of a particular drip irrigation system, I figure it’s my responsibility to keep up with that! It’s sure not that company’s responsibility to keep up with me — especially if I only wrote to them one time! 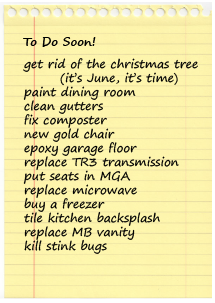 I just checked my list — for laughs. There are about 500 names in my current Eudora address book. That doesn’t count those in the master excel spread sheet of old contacts from another computer or the contacts in my current outlook list. That doesn’t count the single names that are really lists of names. I also noticed as I went through, that I have no idea who some of those people are. So do I think they’ll care if they never hear from me again? Nope! I suppose I ought to spend some time deciding which of these addresses to keep and which to archive to that master spread sheet just in case. But that would take time I just don’t feel like spending right now. And I know that the longer I wait, the longer it will take to actually go through that list. But putting off for tomorrow always seems like the easy choice. I do think that backing up that list of contacts is an excellent idea! THAT I think I will do now. You know, I’m thinking this could be the same kind of put-off exercise as backing up your computer files. But you do have a plan for that, right? Back in the day, the size of your Rolodex was some sort of measure of your worth as a business person. But now, the list in the computer is invisible to the untrained eye. So do me a favor, if you don’t really know me, or you don’t particularly want to either give me something, or ask for something, don’t bother telling me that you’ve moved. Friends, even acquaintances and business contacts, need some kind of attention from time to time if they are to be of any kind of use when you really do need them. As the old song goes, “Reach out and touch me.” But if we’ve never met… then let’s have a formal introduction first. Is this a rambling? Probably. This entry was posted in Deciding: Why is it so hard?, Priorities on 4/7/2008 by Kerch McConlogue. Tis the season for anxiety and stress..
And so be on the look out for signs of heart attacks in women. Huh? What about the searing pain you ask? If a person complains about intense pain in their chest, we seem to have learned to ask about deep pain or throbbing in one or both arms. I can never remember if it’s generally the left or right arm. So it’s best to check both. You might also ask about back pain, breathlessness, and clammy sweating. But studies are showing–and women are saying–that the signs of heart attacks in women are just different from those in men. Depending on which study you read, between 30% and 43% of women who had heart attacks did not experience any type of chest discomfort. But 95% of women did experience some collection of early warning symptoms–either daily or several times a week–for a month or more before having a heart attach. And ain’t this the season for all of those! And a change in the taste of cigarettes! When women did experience chest discomfort, they generally didn’t call it pain, but rather aching, tightness, or pressure. (Although, once upon a time I had a dentist who told me I was feeling pressure and not pain… so I’m pretty sure I’d equate pressure and pain!) They also call it sharpness, burning, fullness or tingling. Clinicians need to include this longer list of descriptors when assessing women with suspected of having a heart attack or at risk for one rather than asking only about chest pain. The study would not say whether the symptoms were predictive of an attach. But in my mind, it’s sure worth paying attention to. They also acknowledge that most of the women in the study were white, so they can’t be sure if ethnicity might make a difference. Women often brush off these kinds of symptoms as sort of the cost of doing business as a woman, a mother, or a general over-achiever. But when you’re body keeps feeling just not right, pay attention! Don’t brush it off. If you ain’t right.. you probably ain’t right! I want you back here reading again next week! This entry was posted in General, Priorities on 12/21/2007 by Kerch McConlogue. In step 1, you assess the danger of a situation. If there’s blood, attend to that immediately. 911 is the standard call for help all over the US — so people know what to do in crisis. Step 2 addresses the need for survival past flowing blood. Money allows you to buy what you need. So people who want to give you money should have a pretty high priority. Step 3: Everything else is negotiable. Maybe that’s what makes deciding hard. Because there are so many options, so many reasons for making one choice or another. It means you have to think about what you decide. Negotiate, evaluate the options and adjust — and readjust –the priorities. Do what must be done. Rules just eliminate possibilities. Sometimes you need that. But don’t be too quick to presume that limited options make deciding easier. You could miss a really great choice. Or an opportunity to learn something new. My father told me “NEVER mess with batteries. The stuff inside them is acid and can burn you.” So I didn’t. It was a rule and it made pretty good sense. When my son was about 10 he and a friend decided to find out what really is inside batteries. They gathered all the 9 volt batteries they could find. (Sorry about your burglar alarm, folks.) They put them in the street and waited for cars to drive over them. They learned that 9 volt batteries are made up of six little skinny batteries, all wrapped together. Cool? Huh? If he’d followed the rule, even I wouldn’t know that. I’m glad, however, that they didn’t get further, because there’s acid in there and you can get burned! Experiment! What away to learn. This entry was posted in Coaching, Deciding: Why is it so hard?, Priorities on 5/26/2006 by Kerch McConlogue. Priorities don’t have to be complicated. Here’s a reminder of my number one priority… always: If there is blood, you must attend to it. Immediately. By the way, that doesn’t mean you have to get inappropriately “big.” It means attend to the problem. If a child fell off the swing and knocked a tooth loose, push it back in, apply ice, and call the dentist. The second step or priority I use for making decisions is this: People who want to give me money take priority over everything else. When my clients, or prospective clients, call nothing else matters. Except, remember, when step one applies. One could say that’s terribly mercenary of me. But, in fact, if you have a job, you go to work every day. You have to. If you don’t, the man won’t pay you. You could choose to take a day off. But you can’t do it randomly. You ask permission. You plan. If something comes up, like blood, it’s an emergency. You call in, if you can. People bleeding are, or should be (in my opinion), more important than work. But when the emergency is handled, you go back to work. After you take that kid with the loose tooth to the dentist, you go back to work. People who want to give you money are the top priority. This entry was posted in Deciding: Why is it so hard?, Priorities on 4/24/2006 by Kerch McConlogue.